You know what I love about holidays? The way they push you to get out of the house to do something, anything, that allows you to dial down (or turn up) with your faves. 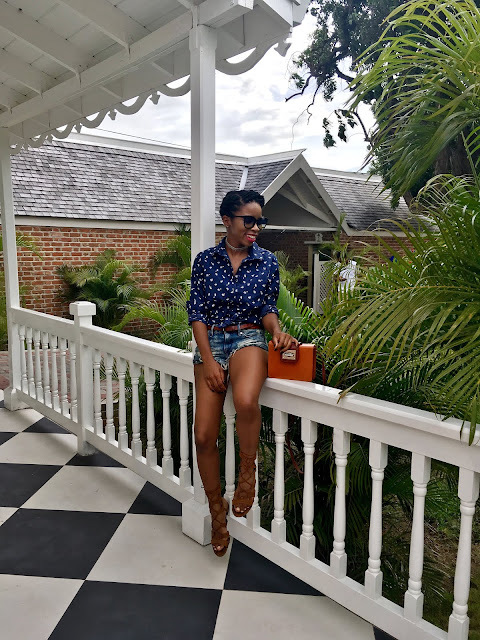 As the island was busy with festivities for our 55th year of Independence, we had the good fortune of an extended weekend and for me, it was the perfect time to reconnect with one of my favourite fellow bloggers, Rushane of RushCam Style Blog. 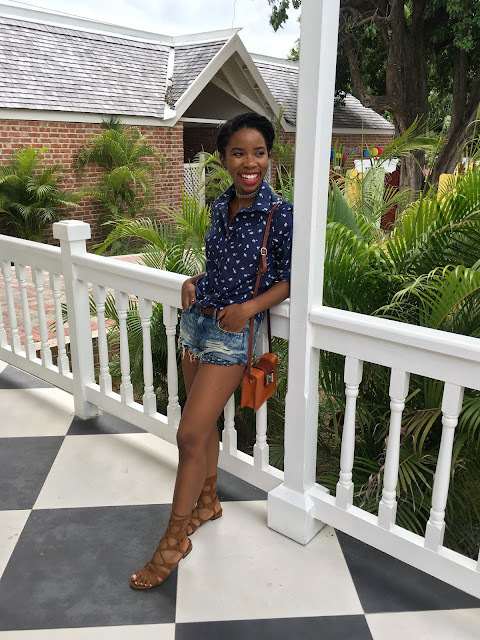 We met up at a local treasure, the famed Devon House to catch up. Devon House has been renowned for its extraordinary (read: irresistibly good) ice-cream which ranked #4 by National Geographic in their book Food Journeys of a Lifetime: 500 Extraordinary Places to Eat Around the Globe! Though we initially had all intentions of pigging out over waffle cones, we ended up stuck in the bakery, which happens to be one my top five desired predicaments of all time. So, instead of ice cream we had warm premium patties and banana bread which was not a bad way to spend a rainy day, if I might say so myself. 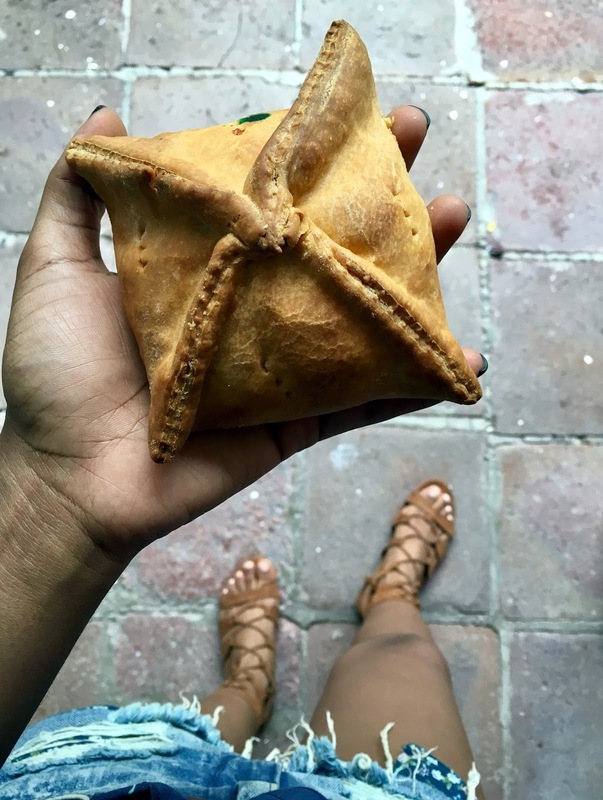 These patties are not the typical Jamaican patties and I will dare to say, they are the best the island has to offer. You can choose between the classic beef, chicken, lobster, fish or most recently curried goat. I'm pescatarian so of course I had the fish patty. You'll be tempted by the thought that just one patty will do, but I can guarantee IT WONT WORK! Save yourself the extra trip and get two at once, unless your guilt can be pacified with the idea that the walk back will burn calories from your first patty. (I do this). Needless to say, if you've never tried a Devon House Bakery premium patty, you absolutely must the next time the opportunity presents itself. As mentioned before, we also had banana bread which was divine. The bakery has a really good selection of classic Jamaican baked goodies that always taste homemade, and not to mention they are value for your dollar. For our little outing I went with a palm tree printed button down from Lands' End (similar) + H&M distressed shorts with floral print pockets (similar) + H&M (mens) leather belt + F21 gladiator sandals (similar) and the cutest little crossbody bag I bought in a leather shop in Rome. Its been super rainy these past few days in Kingston. If its the same where you are, please stay dry friends. I only recently recovered from the flu too so make sure you're all taking your vitamins! OMG this pattie looks delicious! I will definitely get one next time I'm in JA!